The research program of SHAPING SPACE consists of Research Area S, Research Area M and Research Area L. Each research area is aligned to an identifying scale. By scale we mean architectural scale, or the relative dimensions of the projected design or artistic objects that will be created, or the spatial or social contexts in which they are embedded or operate. Research Area S (small) is the scale of the human body, Research Area M (medium) is the scale of interior architecture or the room, and Research Area L (large) is the urban or social scale. These scales also map to specific temporalities or durations appropriate to each con- text. For Research Area S, this equates to seconds or minutes, and reflects the time scale of typical user interactions. For Research Area M, this is hours or days as the typical measure of an architectural program in regard to a user. 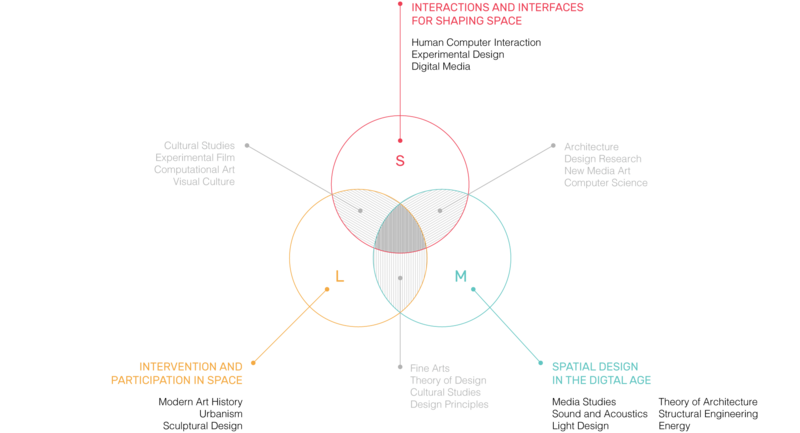 Years or generations then reflect the time scale of Research Area L.
Within the 3 research areas of SHAPING SPACE the topics of Interaction (Research Area S), Spatial Design (Research Area M) and Participation (Research Area L) are naturally interlocked by thematic, infrastructural and methodological links. We also envisage no rigid limits between the three research areas. Principal Investigator’s (PIs) may engage in more than one research area, while some PIs are specifically designated to ensure the knowledge transfer between the three research areas.